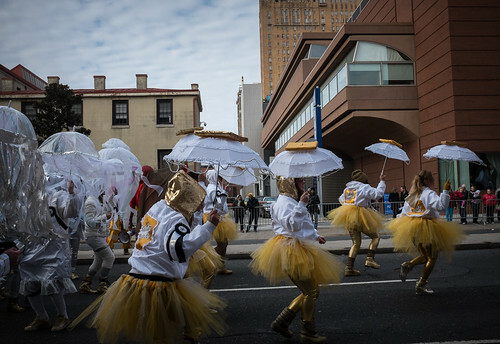 "Oh, Dem Golden Slippers" is both a signature song and signature footwear worn by Mummers during the annual parade held on New Year's Day in Philadelphia. There are days when you just don't have it. Even with the best intentions you head out with your camera and... nothing. All photographers face this and most of the time you just chalk it up to experience and move on. Then there are those days when you are shooting and think to yourself that you are nailing it only to discover later that not only didn't you nail the shot, but you didn't really nail ANY shots. That is true disappointment and the place I found myself on New Year's Day. It was with great excitement that on January 1st, 2014, I headed to Center City Philadelphia to photograph the 114th Mummers Parade. I've had a lot of fun in the second half of 2013 shooting with my Fujifilm X100S and photographing the Mummers was going to be a continuation of this and a great start to 2014, or so I thought. In this photo of the Goodtime Lobster Club I came close to capturing the Mummer Strut that is a staple of the Comics divisions. Just some quick background on the Mummers for those of you who haven't had the pleasure. Some compare the Mummers Parade to Mardi Gras in New Orleans, but that really doesn't do it justice or tell the whole story, in fact the parade itself predates Mardi Gras becoming official in 1900, but traces its roots back to the mid-17th century and is believed to be the oldest "folk" festival in the country. It is a party to be sure, but participants spend all year preparing props and costumes in order to welcome in the new year. I photographed the Fralinger String Band as I worked my way along the parade route. Away from the performance areas you are not limited to shooting from the sidewalk and can venture into the street. The parade consists of local clubs competing in one of four categories; comics (including wench brigades), fancies and probably the most well known, string bands and fancy brigades whose elaborate props and costumes can cost upwards of $10,000. And even though I lived in and around Philadelphia my entire life, this was the first Mummers Parade I attended. I've watched on TV and thought about going in the past, but this year I was going to make it happen and I was determined to get some great photos. Members of the South Philly String Band move props up Oregon Ave. These were the first photos I took during the day and thought I was off to a good start. I was close to getting the right shot, but just seemed to be a bit off. 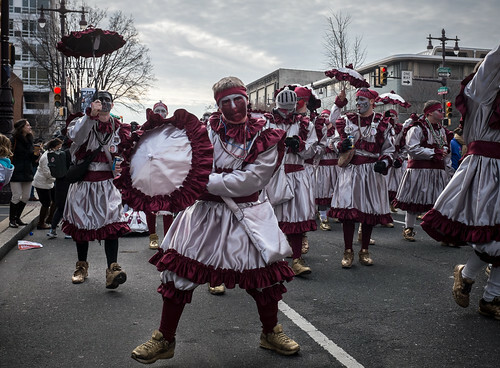 I thought I was off to a great start as I was driving downtown and upon exiting at Passyunk Avenue I saw Mummers wheeling props down Oregon Ave, still hours away from when they would march up Broad Street. So I quickly drove ahead and found parking. 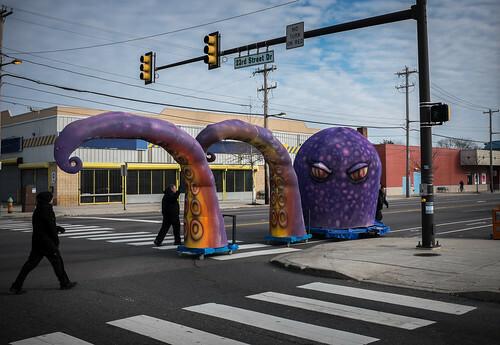 I shot from two different locations as the South Philly String Band wheeled their props, including parts of a pirate ship and a giant octopus, down the street to the start of the parade. This was going to be a fun day I thought to myself. This photo of Finnegan's NYB captures an individual, but fails to capture the excitement of the entire group. I found parking as close to Broad Street as I could and headed off. 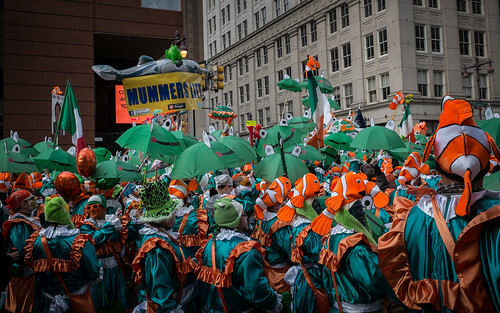 The parade essentially takes place on a one and half mile route between Washington Avenue and City Hall, on a section of Broad Street known as the Avenue of the Arts. In that span there are several locations that are designated as performance areas and while they can get a little crowded, most of the stretch offers plenty of chances to get up close and personnel. My goal was to capture moments that didn't necessarily involve the performances so I roamed up and down Broad Street shooting from both sides of the street and in some cases from in the street. I searched and scanned for interesting characters, faces, antics, anything that would convey the feeling of Mummery. In this photo of the Froggy Carr Wench Brigade performing "Frogs Under the Sea" I captured the color but failed to really capture any movement or celebration. So all this pageantry of color, movement, celebration, costumes and unique characters, was all taking place in front of my camera and I was clicking away sure that I was capturing some really cool images. Yet for some reason what I was seeing with my eyes and what I was capturing just didn't add up. Sometimes I seemed a second off, sometimes I needed to be wider or tighter and sometimes I just missed the key moment all together. That would have been fine if I had realized it at the time and made the adjustments. Not a huge deal because I was shooting for myself and not on assignment. For a professional photographer on assignment, even if you don't have it, you better find it quick, because if you return too often without it, then you will find yourself looking for another job. On this day even if I didn't get the one shot I was looking for, I did get some photos that may not be as bad as I first thought, and probably most important, I had a wonderful time. I was prepared to capture more of this type of behind the parade scenes but ended up focusing more on the parade itself and in the end maybe didn't focus on anything. 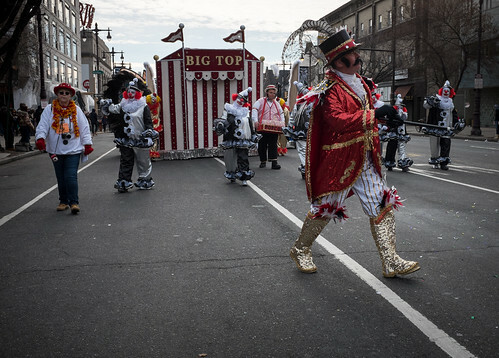 I've already been out shooting again and I have several assignments this week to redeem myself and get 2014 off to the proper photographic start, but my thoughts are already on Jan. 1, 2015, and the 115th Mummers Parade. Not that I'm in a hurry.